Save the Date! Friday, Nov. 18, from 11 a.m. to 1:30 p.m. 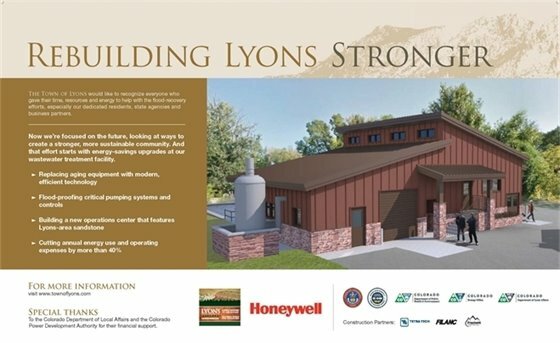 The Town of Lyons, Honeywell, and all project partners invite the community to attend the grand opening ceremony of the new, energy-efficient and sustainable wastewater treatment plant! The event will start at 11 a.m. on Friday, Nov. 18, with speeches to follow at approximately 11:30 a.m. Lunch will be served from 12 to 1:30 p.m. Plant tours will be provided every 15 minutes from 12:00 – 1:30 PM. More information to follow. Please join us in celebrating this milestone! The consultant team of Design Concepts has been selected to lead the planning of the Town’s newly acquired properties – the parcels which were recently attained through the Federal buy-out program. A 6-person selection team, consisting of 3 local residents and 3 Town staff members, conducted the proposal review and interview process, leading to the selection. A Preliminary Stakeholder Meeting for the buy-out properties planning process will take place on Wednesday, Nov. 9 at 6 p.m. in the Town Hall Boardroom. The purpose of this planning effort will be to help guide the Town’s decision for the future use and management of the newly acquired, deed-restricted properties. For more information, please contact Flood Recovery Planner, Matthew Manley. Today's fast-paced, technology-driven world presents an entirely new set of challenges for parents. Fortunately, direction and support are closer than you may think! The Lyons Parks and Recreation department and Lyons Elementary School PTO have teamed up to offer Raising Resilient Children in a Stressful World - a community discussion on parenting in our turbulent times, and how to prepare our children for the challenges ahead. Join presenters, Karen Eiffert, LCSW & Harmony Barrett Isaacs, LPC on Nov. 15, beginning at 6 p.m. at Lyons Elementary School, to explore understanding and solutions to some of today's tough parenting challenges. This free event includes dinner and childcare at no cost to attendees. For more information, please contact Lori LeGault. Living through this election cycle has been tough, but it's not as bad as 1850s Kansas. Join Jack Maness as he discusses his trilogy of historical novels set in that tumultuous time. Inspired by the lives of his great-great grandparents, they are stories of loyalty and betrayal, courage and despair. They ask how ordinary families cope with extraordinary times, why they sometimes turn to violence, and more importantly, why they usually do not. Tuesday, Nov. 8 | 5:30 to 7:30 p.m. 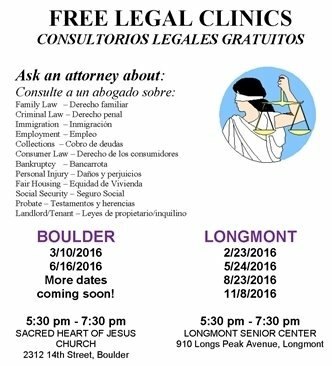 The next Longmont Law Clinic will be next Tuesday, May 24, from 5:30 – 7:30 at the Longmont Senior Center, 910 Longs Peak Avenue. Anyone is welcome to attend and speak with an attorney. No pre-registration required. All services in both Spanish and English.